Following on from my ‘On Broadway’ post, I looked at a station that’s trying to stop their customers from merely passing through without noticing what’s going on around them. 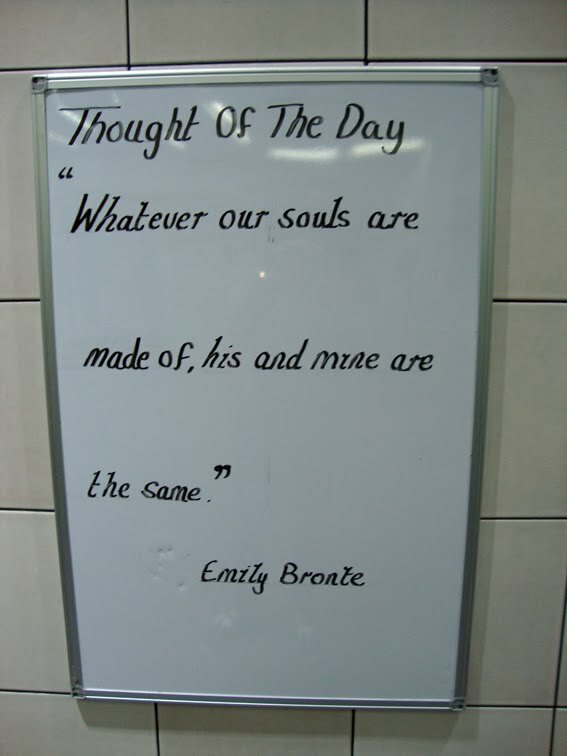 Oval Station, like a few others on the Underground network, have a ‘Thought Of The Day’ board, where staff write philosophical and interesting quotes for their customers to reflect on first thing in the morning, or in the evening after a long day at the office. Passengers only have great things to say about the quotes – one customer liked it so much he bought the station a book of famous quotes as a gift, to use as inspiration! For the 2013 project, I’m going to pop along to Oval Station every day for a few weeks, photographing the board and collecting the images for the Museum. I’m also going to try and interview some of the staff involved about what inspired them to start the project. Does your local station have a thought of the day board? What do you think about it? Share your own thoughts here! Thanks for your suggestions – I will be sure to check them out!